i b i k e l o n d o n: London is changing, and it's all down to you. But what next for cycle campaigners? London is changing, and it's all down to you. But what next for cycle campaigners? I've been away from the blog for a few months travelling, moving house and standing back to watch as London begins to change in a way that was unthinkable just five years ago. As construction in the city centre begins of high quality cycle routes for the first time, it is worth taking a moment to assess how we got to this point, and to ask "what happens next"? 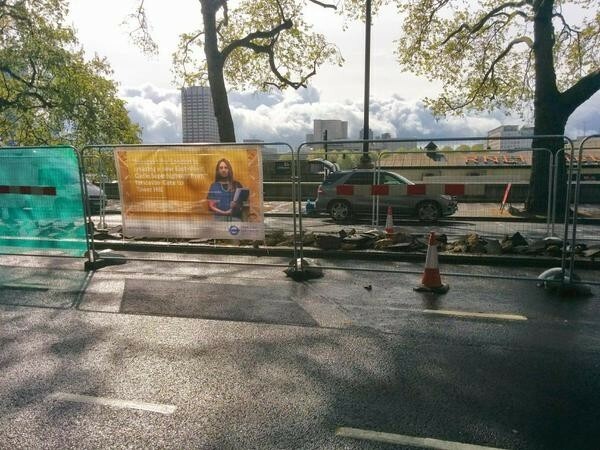 The North / South Cycle Superhighway is finally under construction. Cycle campaigners - myself included - have been saying for many years that the pace of change in London has not been fast enough when considered against the annual death toll of people on bikes and the growth in numbers riding. And yet, in many ways the pace of change has now accelerated faster than anyone could have imagined even just a few years ago. 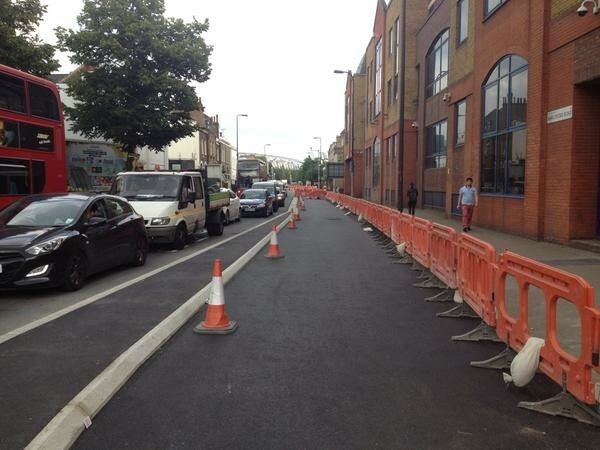 "We ain't gonna get the sort of cycle infrastructure we'd all love. Ever. In such a car-centric society as the UK it would be next to impossible to take meaningful space away from cars." But here we are some 5 years later, and construction of high quality, segregated cycling infrastructure is already underway in London. The plans are by no means perfect, but they will be revolutionary. When TfL's previous Cycle Superhighways were built - effectively little more than just blue paint - cycling levels on those routes leapt. Imagine what the effect is going to be with safe new routes, separated from traffic and useable by all abilities? We didn't just get the kind of cycle routes that people said were impossible, they're going to be game changers too. Aldgate Gyratory is being largely rebuilt, due for completion in September 2016. Segregated cycle tracks in Oval will arrive by next spring. Construction is underway on the North / South Cycle Superhighways from Elephant and Castle to King's Cross, also due for completion by next spring. The most contentious cycle route of them all, the East / West Cycle Superhighway along the Embankment, is currently causing a little light traffic chaos along the river and will be operational by May 2016, not withstanding gaps in the Royal Parks who continue to dig in their heels, and in so doing reveal their prejudices. Cycle campaigner's integration / segregation argument has largely gone away, with most (cough, Hackney, cough) now acknowledging that where traffic volumes and speeds are sufficiently high then separating cyclists is desirable. As consensus emerged, much was made of the need for any new cycling infrastructure to be as fast and direct as the experience of riding in the road, and rightly so. The internet brought us easily accessible examples of best practise from overseas, whilst popular protests in London rallied around dangerous junctions and the need for design rather than behaviour to provide safety. This spawned the London Cycling Campaign's fabulous "Love London, Go Dutch" campaign and #space4cycling which, in turn, led to the Mayoral promise to build better routes. Charting this progress is in itself an interesting exercise. I am struck by just how far we have come; my talk at the 2012 National Conference on Urban Design detailed how design and conditions on the ground emerged as the campaigning issue of our time. This consensus has in turn led to new routes being built on the ground. Here's the audio and slides from that talk, if you fancy a lunchtime history lesson. Design Led Cycle Safety; how the cycling community came to value urban design from ibikelondon on Vimeo. My 2010 talk on Design-led Cycle Safety charts how campaigning has changed in London. "It was at times nightmarishly difficult to manage this, and we saw some absolutely ferocious resistance, kicking and screaming, and we saw a lot more passive resistance, heel digging and foot dragging from whom Olympic cyclist Chris Boardman called Old Men in Limos; you've heard of the MAMILs, those were the OMILs. A lot of objections, which would nearly always start with the words 'Of course I support cycling..."
Gilligan went on to highlight how, with the helps of the likes of CyclingWorks, the OMILS were "comprehensively outfought in the PR and public support battle." "You'll have to read our memoirs, if anyone wants to publish them, to find out how difficult it all was and how close it all came to not happening." "I think we've made enormous progress - unprecedented progress - over the last couple of years, but I believe we're still in the foothills of making London a cycle friendly city and the task for Londoners is to make sure the progress we've made continues after May [2016, the next Mayoral election]." I think this is an honest assessment and shows how hard campaigners have worked to date. Gilligan has been a highly effective banger together of heads, but will he wish to continue as Cycling Commissioner when Boris Johnson steps down as Mayor next year? Furthermore, will the movers and shakers at Transport for London want to go back to playing just with buses and trains once the political drive for cycling moves on? Despite the amount of work involved to date, campaigners cannot yet rest easy. In the short term we'll need to ensure the new segregated routes are fit for use and finished to a high quality. They'll also have to continue powerfully putting the case to the rest of London that the disruption they're currently experiencing will be worth it. Transport for London will need to ensure their spanking new cycle routes are maintained, cleaned and enforced - a cycle track with a truck parked in it is no good to anyone. In the longer term efforts must now begin to focus on the Mayoral election in 2016. Without political will for cycling in City Hall in the future it will be too easy for TfL to draw back from their cycling responsibilities. 'Love London, Go Dutch' and #space4cycling were aspirational campaigns which captured the wider public's imagination about how London could be. As the results of those campaigns begin to take solid form, it's important to find a way to convince London that more of the same would be a good thing. Away from the cycle tracks, lethal lorries remain a chronic issue for vulnerable road users in our city, and much more can still be done on this issue to get the shocking and seemingly inevitable annual death toll down. There is only so much campaigners can do, whereas Boris Johnson has the power to effect lasting change in the last 10 months of his Mayoralty. To keep the pressure up on Transport for London he should appoint a cycling representative to their Board, an easy and much overdue move. He should also push ahead with urgent reforms of lorry safety. In doing so, he'd help to secure his long term cycling legacy and make it harder for future Mayors to unpick his good work. For now, everyone who has attended a protest, written to the Mayor, tweeted, signed petitions and helped keep the momentum going should take a moment to reflect on how far London has come - both in terms of consensus and successes - and enjoy watching the new cycle routes being built. But there's going to be more work to do to elevate London from "the foothills" of being a cycling city. We need to get ready for what's next. I think a lot will depend on who the next mayor is, if they have a genuine commitment to cycling or just pay lip service and back down when things get a bit too tough. Putting party politics to one side, the superhighways were an electoral commitment by Boris and having a democratic mandate must count for something in the battles with OMILs. I wonder if concerns over air pollution could be a major campaigning point as well as this has the potential to be of much broader interest than cycling campaigns which still only really impact a fairly narrow section of the population. The trouble with air pollution is it appears somewhat abstract, creating problems in the future rather than stirring people to do something here and now. @Anonymous I think you're right that the person who fills Boris' shoes will either be on board on just paying lip service. Perhaps, as part of the recent growth, cycling has now become an issue that all candidates will now have to address, like tube fares, housing, crime etc. Having a democratic mandate certainly helped. It was also a good barrel to put Boris over if he got a bit weak-kneed in the face of such opposition. I think air pollution in London is terrible, though I wonder if campaigns about what people would like London to be (like Love London Go Dutch) as oppose to campaigns about what they're against (bad air pollution) are more effective? It's a very minor point, but maybe you could change "where traffic volumes and speeds are sufficiently high" to "where traffic volumes OR speeds are sufficiently high"? At least here in Oxford, there's still an assumption by many (including county transport planners) that segregation isn't needed on 20mph routes, even if they carry 15,000+ motor vehicles a day. @ibikelondon - yes, I agree that relentlessly negative campaigning probably isn't that effective. However in the case of air pollution, you see comments like "oh, we shouldn't slow down cars as that will increase congestion and air pollution" so some clarity regarding effective ways of addressing pollution would be useful. I was mentioning air pollution as an example of an issue where there could be support across a number of groups rather than campaigns that are perceived as just a cycling issue. Also blanket 20mph limits are gaining momentum across the London boroughs but all too often a sign doesn't do anything to actually reduce speeds and volumes as it is never enforced and the road doesn't look like a 20mph road, irrespective of signage. 20mph limits are progress, I think, but the next step will be how to get "real" 20mph roads with commensurate reduction in speeds and volumes. Mark, you write: "Imagine what the effect is going to be with safe new routes, separated from traffic and useable by all abilities." "Overall I would like to commend TfL on having produced an innovative and exciting scheme that moves cycling provision in London (and the UK) forward. 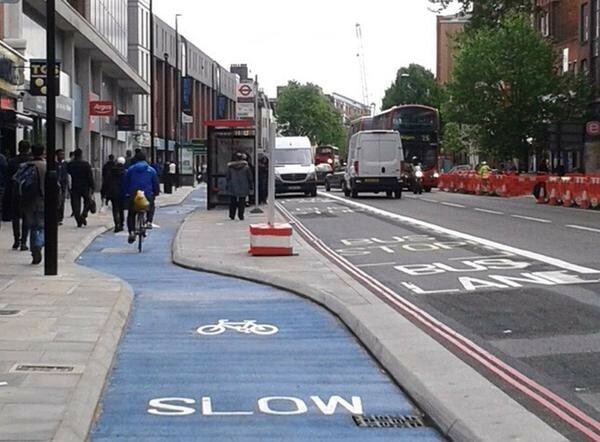 It's a clear attempt by TfL to design for mass cycling" (Rachel Aldred). "This is a really fantastic step change in approach from Transport for London; reallocating road space, and creating safe, comfortable tracks that people can cycle in, away from motor traffic" (Mark Treasure). "Let's look at the positives. Two metre wide bike track with priority over side roads, treated as an extension of the carriageway and not treated like a footpath where you have to give way to every driveway and side road. Fantastic. "If TfL built something to this standard down to Tooting or out to Wandsworth, I think you'd see a MASSIVE increase in the number of people using bikes. What makes me say that? It's pretty simple, really. Make it feel safe, make it convenient and people will use it" (Danny Williams). "For me, what is most exciting about these cycle tracks is that they will help to animate Stratford High Street with actual people. "These facilities will allow older riders, children, more women and even less abled cyclists the opportunity to ride here" (Mark Ames). The numbers, however, rather suggest that, in terms of increasing cycling's modal share, "isolated cycle paths are almost useless" (to quote Ricardo Marques Sillero from Seville). As the Alternative DfT pointed out recently: "I’m sure you could find some streets or bridges in Berlin where people travelling by bike make up a huge proportion of rush hour traffic, as you can in London, but that’s not what modal share is." Even if cycle traffic on these new Superhighways increases threefold, as TfL predict, the cycling modal share will be roughly unchanged. The simple fact is, as David Hembrow blogged recently, "the most important enabler of mass cycling" is a very fine grid of efficient cycling routes. "For a grid of routes to enable cycling," he explained, "it must be high density and go everywhere." We could "introduce" such a high density network over the next mayoralty or, with a lot of luck, we could develop a couple more high profile cycle routes. Both would cost about the same. For the life of me, I can't think of a single reason to pursue the second option. I think you have missed out quite a lot. * There is lot of campaigning to do with pushing TfL on law enforcement (see the campaign around Michael Mason's death);such as making sure that "Operation Safeway" type efforts are not discriminatory against cycling and letting off careless/dangerous driving in the way I think they have been. * Dealing with the abuse that cyclists get in the media and elsewhere. * I do wish people would understand that it is NOT all about the way the highway is laid out. I made a stab in my local authority career at getting support for cyclists re-accessible (i.e. affordable for people on low incomes) equipment, maintenance, refurbishment and roadworthy bicycles, as well as provision of residential parking and confidence training - which many want whatever the highway layout is. (Still available to have that cup of coffee to discuss this Mark, we didn't actually meet when we last discussed this). * Talking about transport policy. However you want the highway laid out, ultimately we have to confront the question of how much capacity there should be for private motor vehicles - whether in amount of carriageway, phasing at signals or car parking. TfL are not just dealing with buses and trains when they are not addressing cycling issues - they are effectively supporting massive car dependence. * Getting TfL/FORS to deal with its failures over the "Cyclists stay back" stickers - a small point in itself, but indicative of commitment. That all needs to happen. Thanks everyone for your insightful comments on this piece, and my apologies for the delay in responding to you. Thanks for your comment, but I think you've chosen a poor example in the CS2Ex. As you know, it currently sits between the Bow roundabout and the Stratford gyratory. Once past either of these points, cyclists are left to fend for themselves. As a demonstration project, I stand by my original comment and believe it has shown to London that it can be done and the system does work. And it does indeed enable a much broader spectrum of cyclists to ride down the murderousd Stratford High Street than before. But as part of a network you and I both know that it is not yet finished. When the CS2upgrade along Whitechapel Rd is complete, you'll be able to ride traffic free from Aldgate all the way to Stratford, connecting with reasonably high quality traffic-free cycle routes along the way such as the Lea river canal at Bow, the Olympic Park network, the Greenway to Barking and Ilford and others (there's your fine grid of routes). 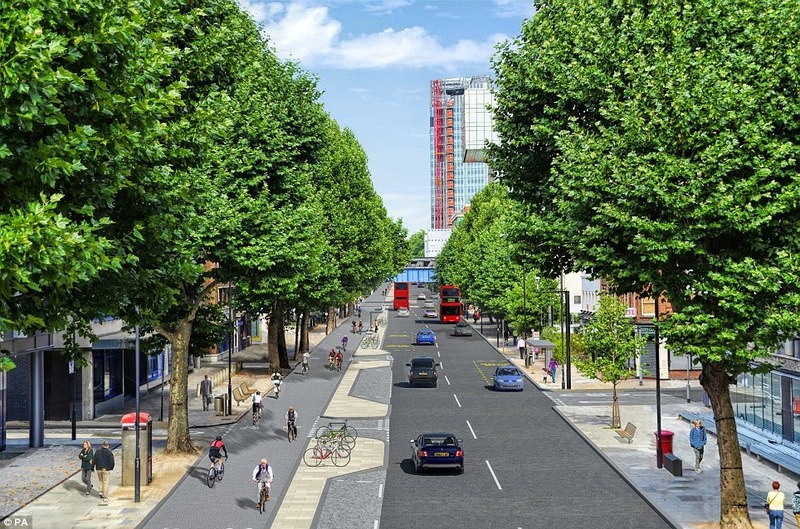 It's also going to be fairly easy to get from CS2 to CS3 on low-traffic roads which will allow you to connect in to a route that will take you all the way to west London in a considerably more pleasant environment than currently exists. I think you misrepresent David Hembrow's comments. Whilst I agree with him that finely-grained low-traffic routes are not only necessary but indeed quite desirable, he would not agree that these should be developed to the exclusion of cycle tracks on primary routes. Pursuing one over the other is a zero numbers game as they compliment and feed in to one another. We need both. All I am trying to establish is that, in terms of "how best [to] go about creating conditions for mass cycling" (to quote from your article), developing isolated cycle paths and hoping one day to join them up is a very weak strategy. As David Hembrow pointed out back in 2008: "Good quality cycle routes are of almost no use if they are not very close together." What do you think of this: "a coordinated and properly managed city-wide core network of cycle routes which reflect the main routes that cyclists want to use and which are designed to a standard of journey quality likely to attract increased use"? Does that sound good? It’s from February 2002, and it was called the LCN+ (source). In November 2005, Darren Johnson oversaw a review of the LCN+. It had become apparent by this stage that the LCN+ was floundering, and that "without a change of gear" the whole project might ultimately fail. Amongst the review's several recommendations, it was suggested that TfL should identify a small number of key routes across London, and prioritise their early completion. "These routes should encompass 'difficult' areas such as Parliament Square," the review added, "and be of a standard for other schemes across London to emulate" (source). 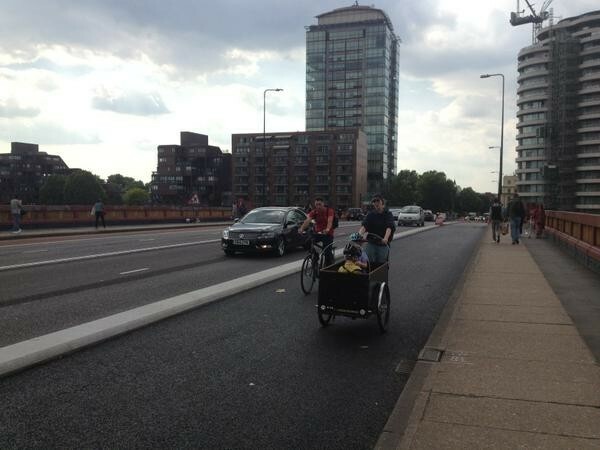 Your article suggests that, having persuaded the LCC about the merits of segregated cycle tracks, "here we are some 5 years later, and construction of high quality, segregated cycling infrastructure is already underway in London". But as you can see, the two new Superhighways were at least ten years in the making. Worse, as Andrea Casalotti reports, because the "fight" — a word both you and he use, incidentally — because the "fight" to install these high profile schemes was much more demanding than anticipated, "insufficient effort" was devoted to the Central London Cycling Grid, "with the consequence that no progress has been made on the core of the Vision". I can't say I am surprised. The Mayor's Vision explicitly states that things will either be done adequately or not at all. What does surprise me, however, is that when it comes to the development of an amenable cycling environment, we seem to think that we know best. "The key note," Steffen Rasmussen said, "is an holistic approach and then a separation of functions." Now, when taking an holistic approach, it is best to begin by making the minimum change for the maximum effect. I am currently working on a map which, though not yet finished, gives you an idea of what I have in mind. Please take a moment to work through the various layers. You said in your reply to Bob Davis that you are a great believer in incremental change. If the network I propose — or something like it — could be made to work during the next mayoralty, then this would obviously provide us with a framework within which to develop more highly-engineered infrastructure. You say in your reply to me that introducing a network first, and then later developing cycle tracks on primary routes is a zero-sum game. I don't understand this. A zero-sum game implies winners and losers. Who would be the losers if we were to pursue this course? Actually, even if there is not much outright resistance to the sort of things I talk about, there isn't much support. The LCC campaigns can't actually achieve that much in ems of directly supporting cyclists. So I think it is an underfunded and improperly supported area. Similarly a lot of it is done badly when it is done at all. The "negative side effects" bit. If reducing motor vehicle capacity on the highway network is required - which I think it is, however the environment is engineered with regard to cycling - would that be what you call a "negative side effect"? My view is that all sorts of things are required which will actually upset a lot of drivers. Finally, with regard to the campaigning effort: in other parts of London without the high concentration of articulate and media-savvy campaigners, sympathetic and high profile organisations, it will be a lot more difficult to get pro-cycling measures through. great blog. love the cycle lanes...shame no-one is using them yet! super smooth lanes are going to be great tho. I still liked Boris's elevated idea. for all type of Moves big or small.